Lovely faucet, but installation instructions need work. For instance, the drain installation does not tell you if/where to apply teflon tape (you can surmise from your old drain - between the plastic and metal threading). Also, I would apply teflon tape to the supply line inputs before attaching them to the counter. The faucet I received has a defective aerator. I contacted the warranty department at Kingston Brass to obtain a replacement. Give your bathroom some distinctive flair, with this satin nickel bathroom faucet. This widespread bathroom faucet features your choice of double-lever handles or double-cross handles. A healthy flow rate of two gallons per minute provides plenty of water for washing your hands and rinsing your face. The included mounting hardware makes installation a snap, even if you're doing it yourself. A solid brass pop-up drain control is also a part of the package so you can quickly fill your sink. Click here to view additional information about this item. Love this faucet! What I didn't see in the product description is that the faucet also swivels which is really convenient for a smallish sink. It gives just the vintage look I wanted for my bathroom. Buy! Buy! Buy! This Faucet! Ordered this faucet for our master bathroom vanities. 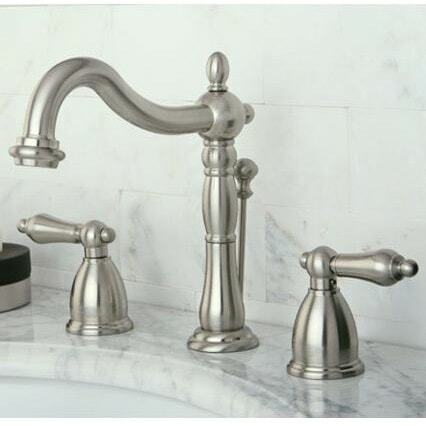 It coordinates great with the Water Creation F4-0001-05 Elegant Spout Wall Mount Faucet. 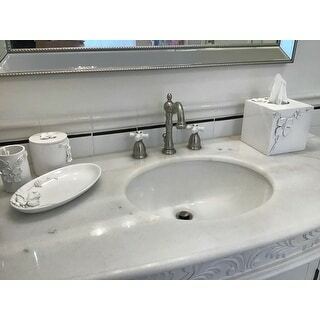 I ordered the cross handles for the vanity faucets and the wall mount faucet. Love the elegant vintage style! Very good quality construction and the satin nickel finish is gorgeous! Gorgeous faucet. I purchased this Vintage Satin Nickel Widespread Bathroom Faucet for my client’s guest bath and it’s a perfect fit! I was looking foe something to match the very expensive tub set I bought years ago. The matching sink faucet set would have cost twice as much as this one and I felt it was the standard for my next purchase. We have not yet installed it but don't anticipate any problems. We are very pleased and it arrived so quickly. I love this faucet. I got the one with the porcelain cross faucets. Looks so good with my farmhouse sink and vanity. I love the height of the faucets and the old fashion look of the faucets. Looks great with my country bathroom. Just sets my vanity off. It was the final touch that I needed. My plumber is coming tomorrow to see everything he will need to mount a wall mount sink with this gorgeous faucet. I am very excited. I have wanted this faucet since I first saw one on television. The faucet is solid. Everything I have read about Kingston Brass, who makes this faucet, is very positive. I will do ,my best to put up a picture of the sink and faucet plus it will show some beautiful tile I bought on Overstock as well. love this set in my vintage-inspired bathroom. Have now bought several items in this line and finish. So far so good. The installation went without a hitch and the pieces seem solid. If they wear as well as they look, I will be thrilled. We LOVE the vintage sating nickle faucet. The faucet moves side to side, and that is a feature that I love. It is well made and it looks wonderful in our bathroom. This vintage satin nickel faucet was exactly what I had in mind when remodeling my bathroom. It looks good on black granite countertop, and I love that this is all brass. It's a great buy for the money (similar models on other sites were at least $100 more than this). Top shelf quality. Solid brass fittings. Heavy. Not your Lowes or Home Depot stuff. I'm very pleased with this faucet. It arrived promptly and in perfect condition. It was easy to install and looks to be very high end but was quite reasonable priced. I will be buying a kitchen faucet next. The quality of this faucet is phenomenal. I did have issues with the first delivery. It was missing the entire left piece. However, customer service at Overstock exceeded my expectations in terms of resolving this little hiccup. My contractor was astounded by the set and the price I paid. It will look wonderful in my updated master bathroom. Very nice faucet. We purchased this to complete our master bathroom renovation and couldn’t be any happier. Great quality! The system arrived quickly without issue. Great quality. Gorgeous in my powder room. I ended up installing these on vanities that I also bought here on Overstock (Stella 43" Single Bathroom Vanity Set) and it came out gorgeous and reasonably priced. Fine quality at a fair price, nice design! nice quality - very pretty. Happy with this purchase. Faucet looks great on the new vanity sink. Beautiful faucets, excellent quality. Love them. "Is Satin nickel the same as polished nickel ? Does it have cast of light gold over the silver?" Satin is more of a dull look. Most people consider satin the same as brushed nickel. Polished would have a shiny look to it. "When will this faucet be back in stock? I need two." "Does anyone know what the model number for replacing the cross handle is? Mine cracked on the hot side." "Hello - I am interested in this faucet but how do I get the cross handles? I am interested in the ceramic ones. Thank you. Jean"
"Does this have a corresponding wall mount for tub? Thank you "
"Can you get repair parts for these faucets when they start leaking?" "Does the valve come with the faucet ? "